A 360° wrap around tube truss clamp for aluminum and other soft surfaces. No scratching, scoring, or DENTING. Weight Limit is 25 pounds. For clamping a pipe to a pipe. Fixed cheeseboro for right angle junctions, swivel for all other angles. 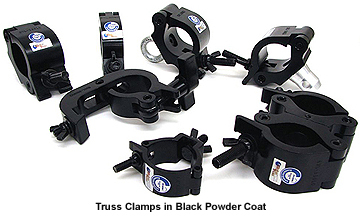 Many of your favorite clamps are now available in black! Click here to view. 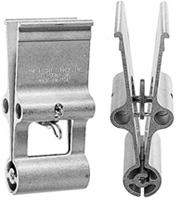 Ceiling scissor clamps are handy items for hanging lightweight fixtures and/or cables from the rails of a drop ceiling. Very convenient when working in an office building or hotel. 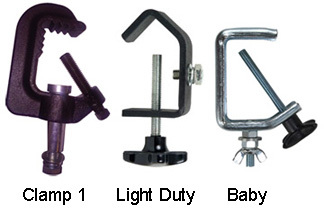 Clamps may be purchased as a single item or with a 5/8" spud. Light duty plastic quick release clamp. The Light Source Mega Airwall Hanger 4"
Uses the same hardware and wrench as the rest of the grid system. 1/2" hole in top for shackles. 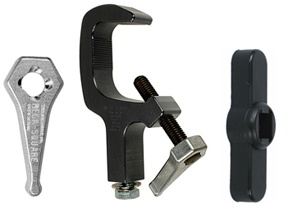 Adapter replaces a C-clamp when you need to place lights on stands or other 3/8" studs. Also known as a "bail block." 12", 18" or 24" long, with 1/2" I D (inside diameter) pipe, with one sliding tee and a C-clamp to attach to stage trees or other pipe structures. Heavy woven nylon sling. Use with shackles to rig truss, pipe, etc. 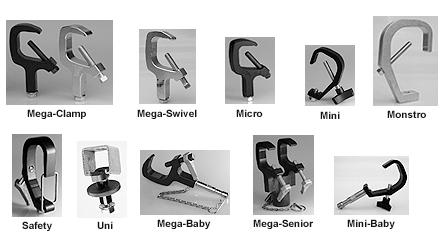 For Stage & Studio C-clamps. Push Handle out of the way, over the bolt, if you need a wrench.